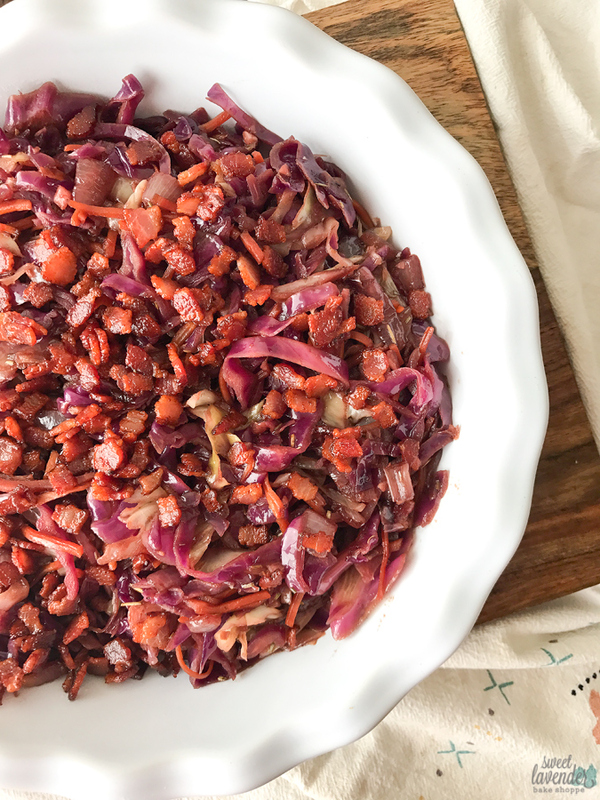 I can't think of a better autumnal side dish than our favorite side dish ever- braised red cabbage with like the biggest ratio of bacon ever. Because honestly, it's all about starting that fall sweater weather body. Who am I kidding? We eat this sucker year round and I sport my sweater weather body all 12 glorious months of the year. 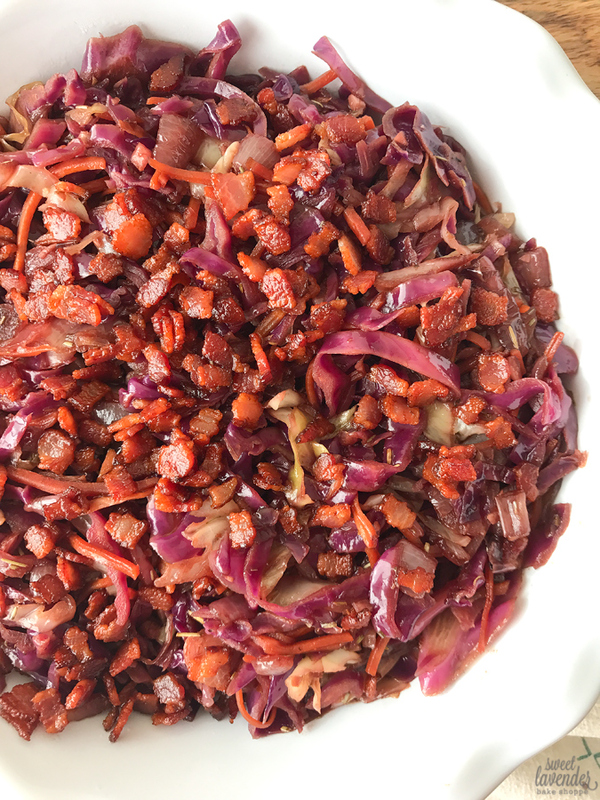 I first made braised cabbage in culinary school and immediately became hooked. Before that, I had only ever eaten cabbage as sauerkraut or coleslaw. But to cook it, and cook it slowly with really deep, rich and robust flavors? Man, that was like "whole other level" good. I've since made my own version and tweaked it little by little over the years, until I've reached what I consider our favorite way to enjoy this dish. 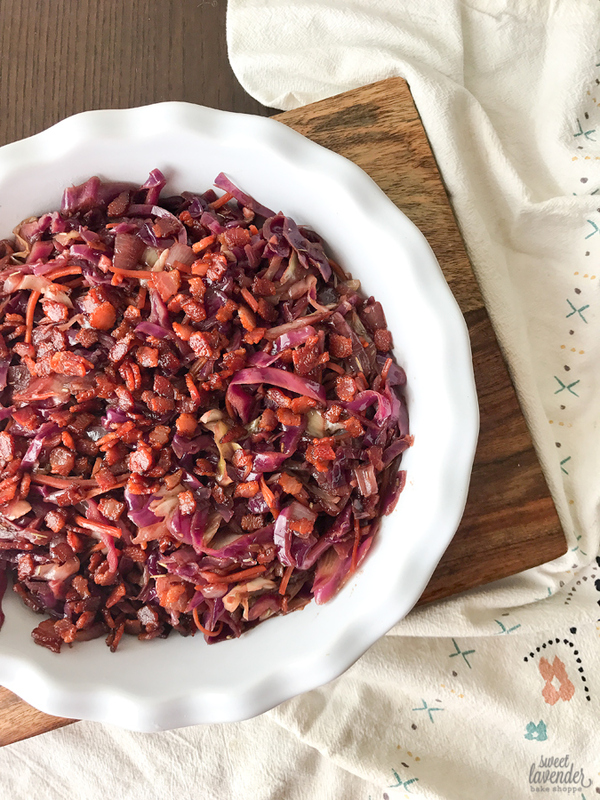 Braised cabbage is a comfort food in our household now. I'm not joking when I say I make it all year round. It's hearty, complex in flavor (yet simple in ingredients), a little sweet, a little smoky, a little tart and a little salty. It's the perfect side to roasted chicken or pork, or along side our favorite veggie filled paleo meatballs. It takes about 30 minutes to make, but I assure you those 30 minutes make the tastiest braised cabbage around. 1. In a large sauce pan/pot, over medium heat, sauté bacon until brown and crispy. Once crispy, remove with a slotted spoon and place onto a paper towel lined plate. Set aside. 2. Pour bacon grease through a strainer, into a glass jar and then pour back into the pot, 2 tablespoons. Add your onion and cook on medium heat until translucent. Then add your garlic and cook until fragrant, about 1 minute. 3. Next, add the apple chunks and cabbage, turn heat down to medium low, and stir and flip with tongs until everything is evenly coated in the bacon fat. Allow to cook for a minute or two until cabbage starts to wilt. 4. Finally, add the salt, rosemary, balsamic vinegar, and broth/stock and cook, stirring occasionally until cabbage is cooked and tender and juices have evaporated, about 20 minutes. 5. Remove from pot and top and toss with the bacon. Serve immediately.